Meanwhile, the Red Skull brings Xavier to meet with Hitler, which prompts Hitler to initiate Red Skull's plan. 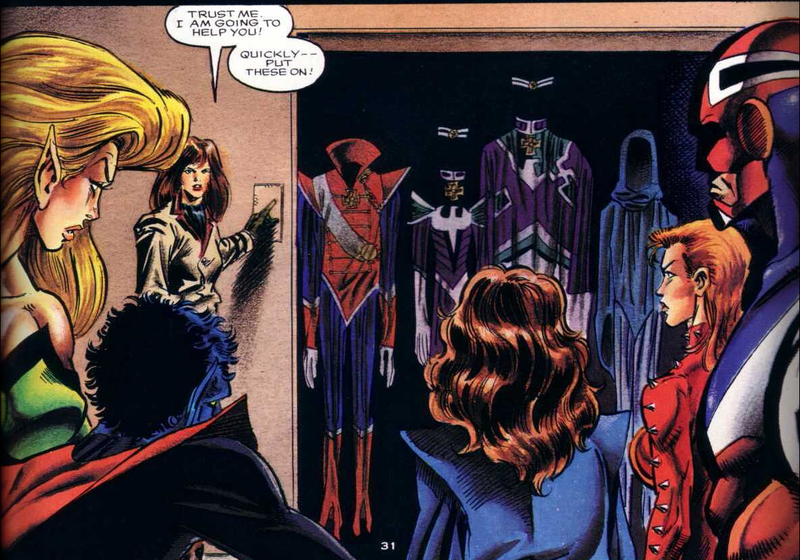 Excalibur proceeds to infiltrate Xavier's lair, but he quickly sees through their ruse. Meanwhile, the Red Skull begins an experimental rejuvenation process on Hitler, restoring his youth and vigor. As Hitler grows younger, Red Skull attempts to use his Nullatron to take control of Excalibur, but it can't deal with the power of Phoenix, which merges with the psychic remnants of Xavier's victims to overwhelm Xavier and the Red Skull, leaving Hitler alone, strapped to the rejuvenation machine, until he de-ages into primordial nothingness. With the cosmic balance restored, the two realities separate, and Rachel explains that the psychic remnants of Xavier's victims had coalesced into a single-entity, which then connected with the Phoenix Force, bringing the two realities together. With the entity watching over the other world, Xavier's goal to create an evolved lifeform is achieved, leaving Excalibur simpluy grateful to be home. A squarebound prestige format one-shot, though it doesn't declare it anywhere on the cover, this issue is technically part of Marvel's ongoing Marvel Graphic Novel series, being #66 in that series (the New Mutants first appeared in the fourth such graphic novel; "God Loves, Man Kills" was the fifth). 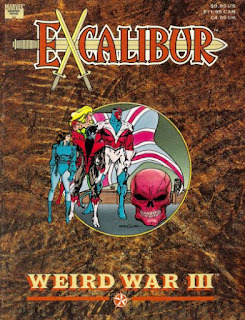 As with the previous year's "Mojo Mayhem" one-shot, this is considered the Excalibur annual for 1990. 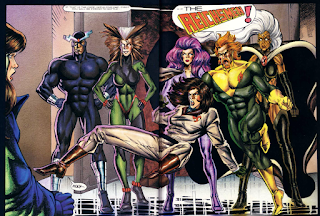 Having previously met the Lightning Squad, Excalibur's Nazi counterparts in this world, this issue introduces the Nazi X-Men, or Reichsmen, comprised of analogs to Havok, Psylocke, Rogue, Storm, and Banshee. This issue features a team pin-up by Chris Wozniak. Co-Penciler "Justin Thyme" is Chris Wozniak, working under a pseudonym. Presumably, he came in at the last minute to finish things up (sound out the name). This issue takes place after issue #34, following Kitty's return to the team. At this point, I feel like roughly half of Excalibur's stories begin with Rachel screaming (kudos to the art in the closeup of her face, though, for drawing her facial scars like scars and not just black lines on her face). Nightcrawler finds himself capable of performing multiple consecutive teleports, sometimes with passengers, which is later explained as being made possible by the fact that in the merged reality, Nightcrawler is actually two people. Meggan displays an ability to generate an energy blast this issue, which I don't think she's ever seen using again. Encountering Nazi Storm, readers are reminded that Excalibur still believes the X-Men to be dead, this story either taking place before the events of "X-Tinction Agenda" or that Excalibur somehow missed all the press coverage of that event that revealed the X-Men's survival to the world. This issue opens up with a surprisingly intense scene involving mutants at a concentration camp getting herded into gas chambers. Well, say this for the issue, the title gets one thing right: it's definitely weird. And kudos to whomever decided the modern Nazi reality from early issues of the series was worth a second look, as it at least gives this issue some grounding in the history of the book. Unfortunately, that's about where the praise stops, as everything about this just seems puzzling, from the title ("Weird War III" is clearly meant to be some kind of play on the World War II-inspired setting, but all it does is make it seem like it's the third in a series of "Weird War" stories, when it is, at best, the second such story) to the premise (the whole "it's not an alternate reality, it's two realities merged into one!" never really gets explained all that well), to specific character actions (Excalibur battles evil Nazi X-Men counterparts before learning their master, Moira, is being controlled by the good version of Moira, meaning there's no reason for her to send the Reichsmen after Excalibur except to give us a gratuitous "Excalibur vs. Nazi X-Men" fight). Certainly, nothing here, from the writing, to the art, to the premise, seems like it warrants a prestige format presentation, and it barely works as the kind of overly-long, disposable stories that get trotted out as annuals far too often. Maybe an Alan Davis or an Art Adams could salvage this, as they have plenty of other otherwise-middling annuals, but while this story can talk all it wants about "merged Earths", between the setting and mediocre art, at the end of the day this, more than anything, reads like an extra-long and long-delayed chapter in the "Cross-Time Caper". Which is absolutely the last thing this series needs at this point. Tomorrow, Excalibut goes nuclear in Excalibur #36. Friday, Wolverine makes friends with robots in Wolverine #38. Next week, the first stab at a Wolverine origin story in Marvel Comics Presents #72-84, "Weapon X". Herr Doktor Moira MacTaggert never gets old. I loved the Angel cameo, and the extremely nice blink-and-you-miss callback to Xavier's very early and very questionable thought bubble of his loving Jean Grey. 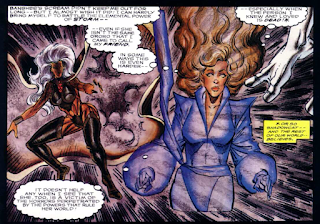 "Meggan displays an ability to generate an energy blast this issue, which I don't think she's ever seen using again." She was able to shoot energy blasts in Uncanny X-Men Annual 11. Huh. I don't remember that. Any idea if she displays the power again after this? She does turn into a dragon that shoots fire in Excalibur 20. And I think she blasted a hole in a wall in Excalibur 9. She uses it in Excalibur #50 as well. You know, I really wish I could have just written that for "Teebore's Take" and been done with it. Well, I’m not reviewing the issue for posterity like you are, or I’d have explained why I think it’s so terrible — even horrible, really — like so: As offensive as it is to charge ten bucks (in 1990 dollars, at that) for lousy, rushed art featuring ugly characters and frequently empty backgrounds in service of such a middling story, it’s even more offensive to open with graphic scenes of psychic Nazi gas/oven chambers; sure, the Holocaust isn’t entirely off-limits to comics in terms of either analogy or direct reference, superhero comics included as Claremont’s X-Men work has proved, but this just comes off as an egregous lapse in judgment. Still sounds like a merry band of Excalibur Nazi equivalents coming to make your day better by their happy singing and dancing. Ah, damn it! I was so careful about that this time, and I still missed one! My favorite of these oversized GNs was always Emperor Doom. I have a ton of good memories of that one. I've not read that. It was included in the AVENGERS: Judgement Day Epic collection though, so I'll probably check it out sometime soon. I finally know what this comic is about!